Faux fur is a soft, luxurious fabric designed to resemble the look and feel of real animal fur. While it’s traditionally used in clothing such as hats, costumes, and accessories, it’s also great for pillows, lightly used upholstery, and stuffed animals. The fur is attached to a heavier knit backing that can be a little itchy. If you’re making clothing that will touch the skin, you’ll want to add a lining. Faux fur can be found in different styles like animal, Velboa, shag, bear skin, and other animal faux furs. Waverly Furocious Faux Fur can be used for home décor. Find all faux fur here. Each type of faux fur has a distinct pile and nap. The “pile” refers to the fur itself, notably the length and softness. The “nap” is the direction that the fur pile is leaning. At a mere 0.118 inches, Velboa faux fur has the shortest pile. This 100% polyester fabric is a popular choice for cosplay and Halloween costumes and is available in different animal styles like leopard, cheetah, pony, cow, and more. This particular faux fur should not be dry cleaned, but rather washed by hand or gently by machine. It’s soft and plush like minky or velvet, but not very stretchy. The White Dalmatian Velboa Faux Fur Fabric is very popular for Cruella de Vil costumes. 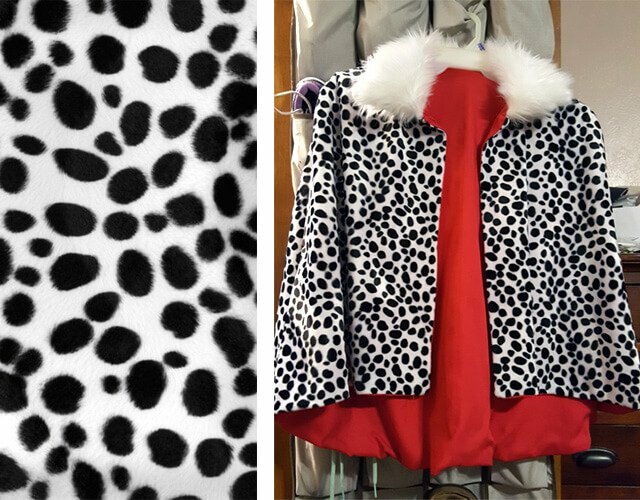 We made a Cruella de Vil Faux Fur Shawl with this fabric. Linda C. made this awesome cape! Thanks Linda C for submitting this photo! Animal faux fur is a dry clean only fabric with a pile of about ¼ to ½ an inch. Depending on the type, it can be 100% polyester or a poly/acrylic blend. Different styles include beaver, mink, and arctic. In addition to apparel projects, this fabric is often used for instrument case linings. 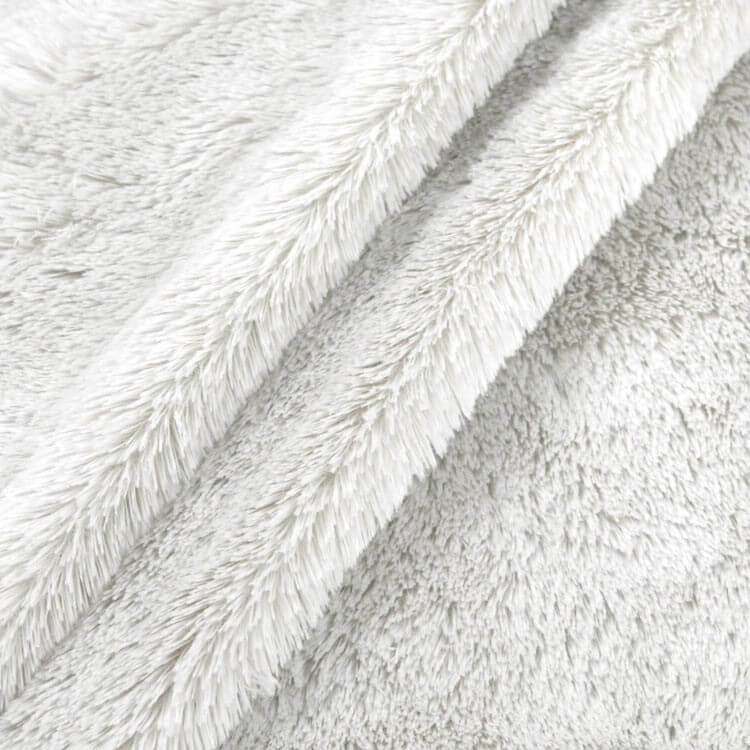 Shag Faux Fur fabric is made of a 70/30 Acrylic/Poly blend, with a longer pile of about 1 and ½ inches. This fabric is often used for chair and ottoman covers, rugs, and tree skirts. Shag faux fur is dry clean only. We used shag faux fur to make this rug. If you want to make a rug with faux fur, you’ll want to use some material with a grip underneath. A very similar choice to Shag faux fur is Bear Skin. 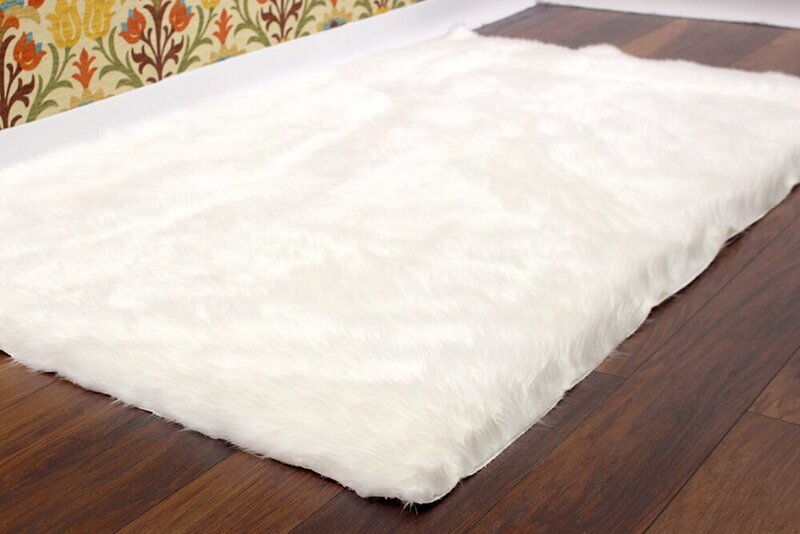 This faux fur is also 100% polyester with a comparable but shorter pile (0.787 inches). Unlike shag faux fur, you shouldn’t dry clean it, you can gently machine wash this fabric. This is a popular choice for stuffed animals and blankets. 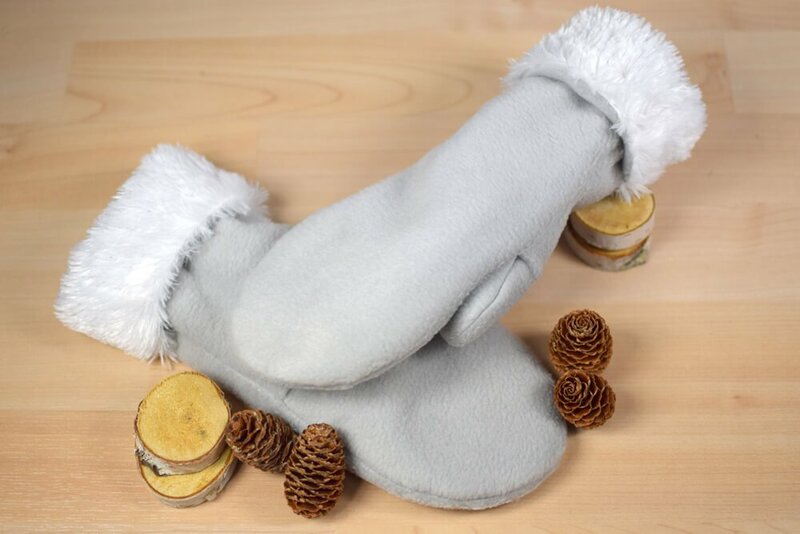 We used bear skin faux fur as a lining for these fleece mittens. Faux fur can be really messy so when cutting, flip to the wrong side and try to only cut the backing using a razor blade or X-acto knife. Keeping a lint roller handy is a good idea. If you’re going along the grain you can rip instead of cutting, it will rip in a straight line. When sewing, it helps to lengthen the stitch length and try to hold the fur to the side. You can use a pin to pull the fibers out from under the stitches, this can make the seam almost invisible. You can dye all kinds of faux fur using Rit DyeMore Sythetic Fiber Dye. We carry this dye in a wide variety of colors and shades. Click here to shop faux fur fabric. Fasteners for long hair faux fur?